For many years, the presence of the beautiful Isabella has been almost non-existent. Moreover, many say that her ghost, no longer appears in the vast hallways of the Medici mansion, which now belongs to Cerreto Guidi in the province of Florence. The last time she appeared was quite possibly many years ago in 1953, when she was seen by several actors who intended to make a film within the building, a sighting that had quite an impact on the American press. To this day, the oxbow which dangles threateningly from the ceiling of the nuptial bedroom serves as a reminder of tragic incident of Isabella de’ Medici (or better still tragic end). Isabella, the daughter of Cosimo I de’ Medici, was born in 1542. She was known as a woman of great beauty and charm and because of this she became involved in many romantic relationships. 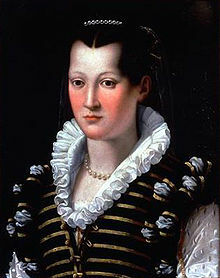 As a result, she has, in fact, been tagged as the “Star of the Medici House”. However, she was also extremely well educated as she could speak many different languages, play instruments, sing, write verses and even had her Poggio Imperiale mansion in Florence transformed into a haven of authentic literary and artistic works. Unfortunately, the future, or better still, the political and economical interests of her family, meant that she was forced to marry an extremely violent and agressive man called Paolo Giordano Orsini, who besides being a greedy philanderer was the duke of Bracciano. The two of them lived in Rome for many years however in 1576, Paolo had to go away and complete a long military campaign. Therefore, Isabella returned to Florence, as she often used to, along with Paolo’s cousin, Trolio Orsini, who was a lot kinder and better educated than him. In theory, Troilo was supposed to have watched over Isabella whilst his cousin was away however the similarity of their characters soon became apparent to the both of them. This together with the fact that she was a member of the Medici family and had maintained her flourishing beauty for 34 years resulted in a dangerous affair between the two of them as an uncontrollable passion took hold of them and they soon became lovers. No one knows how Paolo came to know about this but it definitely damaged his pride and he decided to settle things in a way, which to him seemed very appropriate. He was advised, so it seems, by one of his many lovers. L’Orsini ordered his wife to come and find him at Cerreto Guidi’s mansion. It was here, on the 16th July, that after having dined, the two of them went together to the marital bedroom. However it was not a night filled with love. As soon as Paolo was certain that they were completely alone with Isabella, and that he would not be seen, he lowered the oxbow which was hanging by a rope which had been looped through a hole that had been made in the ceiling earlier on. Then, with the help of several hit men, he drew the rope around her neck and brutally strangled the beautiful Isabella. Her lifeless corpse was then left to hang freely above the bed. Indeed, this very simple method of “divorcing” his unfaithful wife minus all the red tape proved to be very popular in the Medici house. In fact, only 6 days before, in another magnificent mansion in Mugello, belonging to Cafaggiolo, Pietro de’ Medici had strangled his 21 year old spouse, Eleonora di Toledo, guilty of having cheated on him with a valet. In both cases, Francesco de’ Medici, the newly appointed Grand Duke of Tuscany, chose not to take any action. This being because he too was also guilty of commiting adultery. He was having an affair with an attractive Venetian adventurer called Bianca Cappello, and he knew that if his wife ever found out she would most probably kill him. The only one who managed to escape the violent revenge of his cousin was Trolio Orsini. This was because following the murder of Isabella, Paolo fell in love with another woman, Vittoria Accoramboni, who had her husband killed, and after 2 years they got married. However, once her husband was dead, Vittoria also ended up being murdered by another Orsini. We have already seen that, from time to time, poor Isabella used to love reappearing during the night in the cold rooms of Cerreto Guidi’s mansion. However, for some years there has been not a trace of her presence. Perhaps the spirit of this beautiful, educated and unfortunate woman was just searching for a bit of love and she has now found it at last? Or maybe this is just a break, a pause in anticipation of her return? Hung up on the walls of the mansion, there are still portraits of both Paolo Orsini and Isabella de’ Medici. He is portrayed as a dignified man with a proud gaze. She, on the other hand, is depicted with a sweet and youthful face featuring a mysterious smile, not to dissimilar to that of the Giaconda, and a look, which can only be construed as a profound, inconsolable sadness.